Chocolate scorches easily, so always melt it over hot - not boiling - water. It is best to use a double boiler, but you can improvise by using a cup or bowl in a small saucepan over very gentle heat. The water must be kept below simmering to prevent steam from curling up and hitting the chocolate. If steam gets into the melted chocolate it will immediately thicken the mixture to a stiff mass. If this does happen, however, you can rescue the chocolate by softening it again. To do this, add 1-2 tbsp. of vegetable shortening (never use butter as it contains moisture which will cause the chocolate stiffen even more!) to the chocolate and stir vigorously. You can also melt chocolate directly over very low heat in a heavy gauge saucepan, but you must watch the mixture carefully. What Does Tempering Chocolate Mean? TEMPERING is a method of heating and cooling chocolate for coating or dipping with chocolate. Proper tempering results in chocolate that has a smooth and glossy finish. The tempered chocolate will have a crisp snap and won't melt on your fingers as easily as improperly tempered chocolate. Properly tempered chocolate is also great for molding candies because the candies will release out of the molds more easily and still retain a glossy finish. Grate or chop the desired amount of chocolate. Place two-thirds of the chocolate in the top pan of a double boiler. Heat over hot, not boiling, water, stirring constantly, until chocolate reaches 110°-115°F. Place the top pan of the double boiler on a towel. Cool to 95°-100°F. Add the remaining one-third of chocolate to that top pan, stirring until melted. The chocolate is now ready to be used for molding candies, coating or dipping. Starting with a pound of broken chocolate, melt two-thirds of the chocolate over indirect heat, such as in the top pan of a double boiler. Melt just until the chocolate is liquid and smooth (At 110°- 115°F). When it is smooth, add the remaining one-third of broken chocolate and heat again until the entire chocolate becomes smooth. 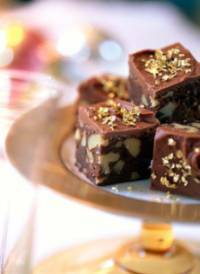 Pour the chocolate onto a marble or laminate surface. Using a spatula, scrape and stir the chocolate across the surface to smooth and cool it. When the chocolate is cooled to 80°- 82°F, return the chocolate to the top pan of the double boiler. Place over hot, not boiling, water. Heat and stir constantly, until it reaches 87°- 91°F. Remove the top pan of the double boiler. The chocolate is now ready to be used for molding candies, coating or dipping. * Do not heat above 130°F since chocolate, especially milk chocolate, is very sensitive to heat and will scorch or seize easily. * Be sure no liquid gets into the chocolate as this will cause clumping or seizing. Source: Ghirardelli Chocolate Company. 1. Chocolate is very delicate and absorbs moisture and odors easily. Store chocolate in a cool, dry place away from drafts and light. The best temperature for storing chocolate is 54 to 68° F. (12 to 20 C). 2. Melt chocolate at temperatures between 104-115° (40-45 C). You should not melt chocolate directly over the heat source, but over indirect souce of heat such as hot water. This way the chocolate reaches a more uniform temperature. Do not try to speed up the melting process by increasing the heat. This will cause the chocolate to "seize" or harden unevenly. Chocolate prefers to melt slowly -- you will be surprized how little time it does take. Usually, while the chocolate is melting you can prepare other ingredients, etc. 3. If you plan to use chocolate for dipping, then you must "temper" it. Tempering is vital if you want a nice glossy shine. This is the classic way to temper: To temper, chocolate must be heated to 104-115° (40-45 C). When it has melted and has reached this temperature, pour contents out onto a cold surface (preferably a marble slab). With a spatula spread the chocolate around on the slab for several minutes. With the spatula transfer the chocolate back to the pan and check its temperature (88-90°). If necessary place pan on top of the hot water to bring temperature to 88-90°. The chocolate is now ready for dipping, but check the temperature periodically. An alternate, and a bit easier, method to temper chocolate is to reserve about 2 tablespoons of the unmelted chocolte and cut into very fine pieces. After the initial batch of chocolate has melted in the top of a double boiler to 104-115°F, remove the pan, wipe dry and add the reserved chopped chocolate. Stir until temperature of 88-90° has been reached.You may have to place pan over the hot water again to bring temperature back to 88-90°. Tempering is important because it determines the final gloss, hardness and contraction of chocolate. When you melt chocolate, the molecules of fat separate. In order to put them back together, you must temper it. There are a variety of ways to do it but the result is always the same. Chocolate is tempered when its temperature is between 84° and 88°F (29° and 31°C). One of the easiest way to temper it is to place chocolate in the microwave for thirty seconds at a time on high power until the chocolate it melted. Be very careful not to overheat it: The chocolate may not look as if it has completely melted, because it retains its shape. The chocolate should be only slightly warmer than your bottom lip. You may still see lumps in it once you've stirred it, but don't worry; the residual heat of the chocolate will melt it. You can also use an immersion blender to break up the lumps and start the recrystallization process. Usually the chocolate begins to set (recrystallize) along the side of the bowl. As it begins to crystallize, mix those crystals into the melted chocolate and they will begin the recrystallization process. Chef Torres likes to use a glass bowl because it retains the heat and keeps the chocolate tempered for a long time. (note: this is one way to temper chocolate. Checking Tempering: A simple method of checking tempering is to apply a small quantity of chocolate to a piece of paper or to the point of a knife. If the chocolate has been correctly tempered, it will harden evenly and show a good gloss within five minutes...............From the book "Dessert Circus" By Jacques Torres. Be sure that the block of chocolate is cool and firm. Grate on hand grater, cleaning the grater often so that the chocolate doesn't clog the surface of the blade. You can use a blender, but be sure to cut the chocolate into small pieces first. Chocolate should be stored in a cool, dry place at a temperature of about 60F. If the chocolate becomes too warm, the cocoa butter rises to the surface and forms a dusty gray film known as "bloom." This "bloom" is not harmful and, once the chocolate is melted, it returns to its natural rich brown color. If you do store chocolate in the refrigerator or freezer, take in out and let it stand until it returns to room temperature before you use it in a recipe. Chocolate is very sensitive to sudden changes of temperature and you will not get the best results if you do not treat it with respect.